Generally avoiding the task at hand: cleaning my sewing room…Fortunately, my sewing room was organized just enough to find these ground black walnut shells– purchased at Rose Mille several weeks ago. I used them to add heft to the cushion and sharpen the pins. As you might have guessed, cleaning the sewing room is just NOT a priority! However, readers of The Inbox Jaunt are a priority…If anyone is interested, I can write a tutorial on making pin cushions—just say the word! Smiling!! I have the same thing happen when I start that sewing room clean up…if we did that more often look what fun things we could whip up Lori! Sweet pin cusion. A tutorial would be welcomed. Thank you. Glad to see I’m not the only one that gets distracted! And what a perfect outcome! Yes, I would love to see the tutorial- and to hear about the filler you used- I never heard of using that product before. and I wonder what people think of using that as a shower favor–wedding shower coming up soon. I purchased the filler at a shabby chic boutique, but one of the readers of the Inbox Jaunt said she buys them at Petco. I will check that out and let you know. Also, how many do we need for shower gifts? We better get on it FAST! 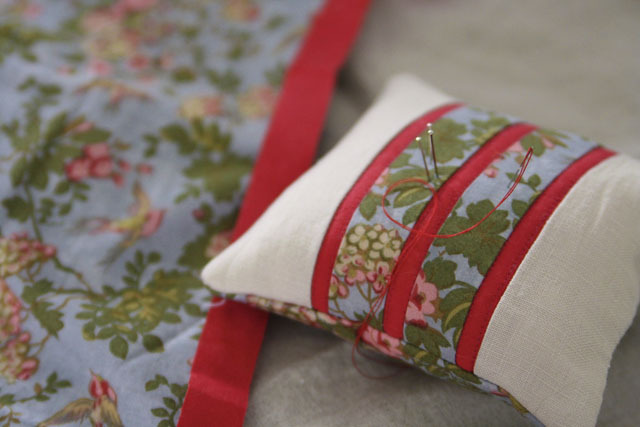 I love to use those little “leftovers” that way…and I can always use a new pin cushion! Depending on the distractions, it may take a month–in which case it will be a mess again and you can start all over! In the meantime, I hope you get a few fun pin cushions out of the deal! What a great pin cushion. I would love to see a tutorial on making them. I love your pin cushion – really pretty. And what a clever way to insert your pins! I get my ground walnut shells at the pet supply store, I think at Petco. Saves $$. Wow! Love your little pin cushion. It is a great way to use up odd pieces of fabric. We have so much in common. Cleaning the sewing room for me is like pulling teeth. It’s also amazing that as a way to stashbust–I’ve started Hawaiian quilting little squares that will be turned into pin cushions. I, too, will be using ground walnut shells as the stuffing. I have just recently found out about them. 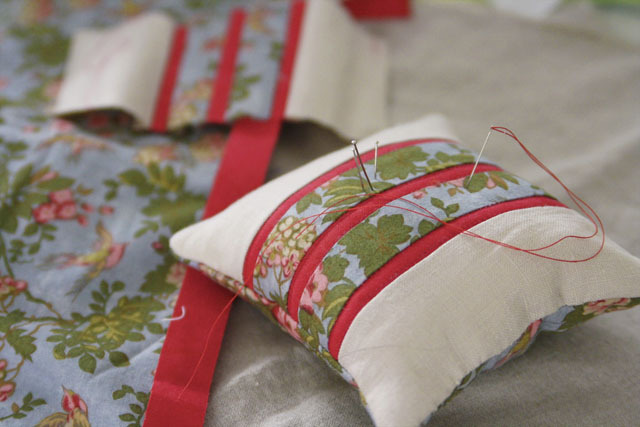 Can’t wait to see your Hawaiian quilted pin cushions–they’d make great gifts! I love Hawaiian quilting and will be featuring a lot of it this month. So great to hear from you! I will try to have the tutorial ready by the end of this week–so keep reading! What a cute pin cushion. Thank you ahead of time for doing a pin cushion tutorial. I’m so glad distraction in cleaning a sewing space is a common trait – I thought I was ADHD at 63 years old!! 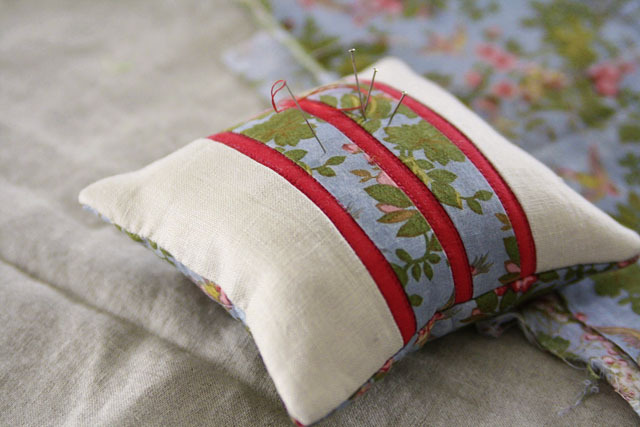 I would also love to see a tutorial on the pincushion and how you use the ground walnut shells. So mine aren’t black Walnut shells but I did get mine at pet mart and it’s used for lizard and reptile aquariums. Pumpkin pin cushion? ! Yes please! I have used a steel wool pad surrounded by batting or stuffing. Oh yes! Please do make a tutorial. I love making pin cushions. I get my ground walnut shells at the pet stores. It is reptile bedding. I just moved from another house and all my stuff is in boxes. My new sewing room is not finished yet so I hate to unpack everything and then have to move it when the new room is done. I have been looking for something specific and had to open boxes until I found it. It’s been a pain. Yes! Pumpkin – pin cushion tute – YES PLEASE! 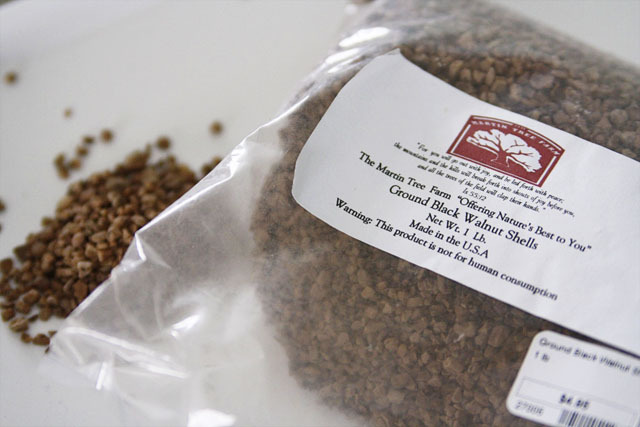 I just bought a bag of ground walnut shells but I see yours are larger – I mean mine are “ground – like they almost look like powder.” I’m now wondering if I bought the wrong thing – yikes! I think it will still work. Add a bit of leftover batting too! Yes! I am a old/new quilter …quilted the old way for many years and now learning “new” techniques. 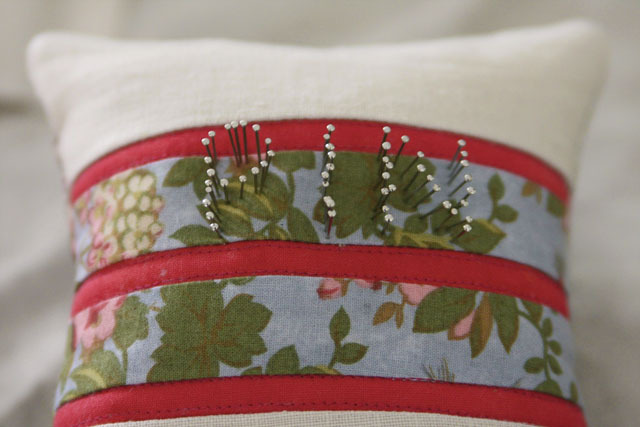 .. i am so wanting to start a pin cushion collection! So many cute ones out there!